Jerry Lewis has been organizing and hosting a Labor Day telethon to help raise money for the Muscular Dystrophy Association (MDA) since 1966. Over the years, Jerry has helped raise over 2 billion dollars. 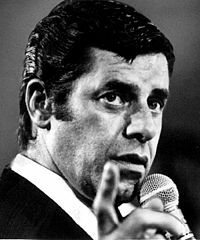 In fact, Jerry Lewis is one of the few fundraisers who actually brings in more money than is pledged. Over the years, Jerry Lewis has received numerous awards for his work with the MDA over the years, including being nominated for the Nobel Peace Price in 1977, a U.S. Department of Defense Medal for Distinguished Public Service in 1985, and the Governor’s Award from the Academy of Television Arts and Sciences in 2005 for his long-running telethon work. The telethons are typically filled with a great many stars of stage, screen, television and music. For instance, one frequent performer in the 1970’s and 1980’s was the late Frank Sinatra, who surprised Jerry Lewis by impromptu re-uniting him with his long-time partner Dean Martin in 1976, their first televised appearance together since the team broke up decades prior. Jerry Lewis has been MDA’s number-one volunteer for more than 50 years. Despite battling debilitating pulmonary fibrosis, severe back pain and a heart attack in recent years, the MDA National Chairman has never missed a Telethon. No one knows why Jerry Lewis, MDA’s number-one volunteer, chooses to devote so much time to helping people with neuromuscular diseases. He feels it isn’t important why he’s involved; rather, it’s important that he’s involved. Jerry Lewis receives no pay for his tireless year-round work for MDA. — Other celebrities who serve as Telethon co-hosts and performers receive no pay for their efforts either. The first incarnation of what would be the MDA Telethon was in the form of a series of specials produced in the 1950s, some featuring Jerry Lewis with partner Dean Martin. Even after the trauma of the Martin and Lewis breakup in 1956, Lewis remained committed to helping MDA and finding new ways to garner support for its cause. The first Telethon was held in June 1955 at Carnegie Hall in New York. The 16 1/2-hour show raised $600,000 for MDA and was broadcast on DuMont station WABD. The first MDA Labor Day Telethon was broadcast in 1966 by just one station in New York City. It was the first televised fund-raising event of its kind to raise more than $1 million. Certainly one of the most unforgettable moments occurred on the 1976 broadcast, when Frank Sinatra brought Lewis’ estranged partner, Dean Martin, onstage for an impromptu reunion. The comedy duo had barely spoken for 20 years. The surprise embrace Lewis received from his old friend provided one of the most touching moments in the Telethon’s remarkable history. Sammy Davis Jr. help his friend Jerry for many years on the Telethon, including the first in 1966. Jerry has been closing the Telethon with the theme song for “his kids,” “You’ll Never Walk Alone” for over 40 years. In 1998, the Jerry Lewis MDA Telethon made history as the first telethon seen around the world via Internet simulcast, hosted by RealNetworks on MDA’s Web site. The 2010 Jerry Lewis MDA Telethon is the 45th annual Labor Day show. It will be broadcast on 190 “Love Network” stations across the country and can be seen on the Internet at http://www.mda.org. Some 50 million viewers in North America watch the MDA Telethon each year. The Telethon moved to Las Vegas in 1973 after seven years in New York City. For the past 11 years the show has been broadcast from the Los Angeles area. The 2007 Telethon is back in Vegas and live from the new South Coast Hotel on Las Vegas Boulevard.